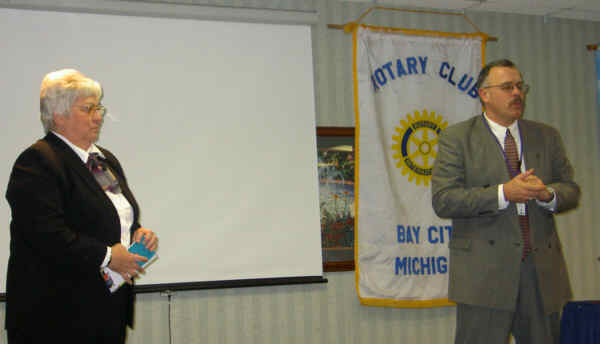 Mike Dewey, superintendent, and Mary Ellen Bluem, Instructional Services Director, explain book give-away program to the Bay City Rotary Club. This week's program: Patrick Flynn, new director of the Saginaw Bay Symphony Orchestra. Last week's program: The Imagination Library, Mike Dewey and Mary Ellen Bluem, Bay-Arenac Intermediate School District. Upcoming programs: Centennial Celebration, Feb. 23, evening joint meeting of Bay City noon and morning Rotary Clubs, DoubleTree Hotel; 250-300 expected to attend; PDG Jerome Yantz, chair. Bay City Rotary History Book to be distributed at the meeting. Twin club, Zekeriakoy, Turkey, where Muslims celebrate a festival recalling Abraham's willingness to sacrifice his son by giving meat to the poor. Committee members Anita Bowden, chair; Jerry Hill and Roger Pickering. What if there was a program that helped children increase reading scores three-fold over present levels by the time they are ready for school? Well guess what, there is! Thousands of youngsters all over Bay and Arenac counties will soon be finding monthly gifts in their mailboxes. The gifts will be books, provided in a partnership between the Bay-Arenac Intermediate School District (BAISD), local donors and the Dollywood Foundation of country music singer Dolly Parton. The Dollywood Foundation obtains the books at discount prices, promotes and coordinates the program nationwide. The parents of more than 2,600 youngsters ages 0-5 havealready signed up, a response about 25 percent higher than anticipated for the first year of the program, according to Mike Dewey, BAISD superintendent. The idea behind the program, called the Imagination Library, is to improve literacy byacquainting all youngsters with books during their early formative years, explained Mary Ellen Bluem, BAISD director of instructional services. "The idea was unanimously endorsed by the superintendents and we are working with community leaders to help get the program started," she said. Young people will begin receiving their books by March, she said. The cost is $27 per year and there are about 7,600 children in the 0-5 age category in Bay and Arenac counties. Total cost toserve all children in that age group with the program would be $206,000, eventual goal of the fundraising. "The program will give back ten-fold, said Mr. Dewey, adding: "It will make a difference in state assessments and is an economic development tool. Mr. Dewey said that every dollar spent on improving reading for pre-schoolers saves $7 in remediation of early reading difficulties. "With this program we won't have to deal with so many special needs cases," he said. The Imagination Library ties into "Reading is Bay County's Business," a program of the Bay Area Chamber of Commerce that involves dozens of Rotarians and other volunteers reading to elementary classes and donation of books to the school libraries. Through the Imagination Library program, a hard cover, high quality book is provided every child. Parents are encouraged to read to their children, an idea reinforced by the 20 Minutes A Day" program operated by the Bay City Public Schools. Thirty eight states are already participating in the Imagination Library, the BAISD officials explained. Only Bay, Eaton and Allegan counties in Michigan are currently part of the program, they said.